Liz's Paper Loft: My Creative Time's September Release ~ Day 3! Hello! Can you believe that we are half way through My Creative Time's Sneak Peeks?! Today, Emma asked us to use Whimsical Calendar Days and XL Label Die! Oh my goodness, you will LOVE, LOVE, LOVE, this stamp set and die!!! I will also be submitting this for a Cricut Circle Challenge! Nice Card Liz. I love all the details. I especially love that background paper you used. WOW,i love this one!! I love the background,the twine...well everything!! Awesome!! This is a super cool card! Love the colors! Your card ROCKS!! love the paper and all the extra details! Fab job on this!! Very cool card, love all the details!! LOVE this!! LOVE IT LOVE IT LOVE IT!!! Did I tell you I LOVE IT!! I'm a fan of halloween stuff and definitely of the newsprint papers too this is so my kind of project!! Awesome card Liz!! Love every detail you put into this one. Great job of showcasing Emmas new release!! Oh my goodness. This has to be one of the cutest little halloween cards. I love love love it. I am so wanting the Chic & scary cartridge!!! Love the twine (although at first I thought it was a spider when you quickly look at it). Great great job. This is an awesome card. I love everything, the stick pin, twine, & colors. It's just perfect!! Liz, this is GORGEOUS! Love, love, love it! Love the netting and your great cuts (I think I need Chic & Scary), and I need a tutorial on making your pretty stick pins! You did it again great job!! Beautiful job! Very stunning card. I love getting ideas from you. TFS! amazing card! I love every spooky thing about it! Okay, I have to say it!!! I love your card the bEST!!!! It's amazing!! So getting this set and die!!! TFS! Hey Liz love your card looks fabulous. Love that background paper! Great color combo!!! I do love this card! I love the news print background! great touch! Liz you rocked it!!! I love it! Love this Liz! That die looks really cool! This is gorgeous. I L♥VE it!! Very cute! I loved that u did something different with the die. I really like this project! This is an amazing card. That stick pin is perfect with the twine!! ;) Great job! Love your design, especially the paper and how you used it. Thanks for sharing! this is a great card! I love the look of that printed black and white back ground. Perfect halloween card! Liz this is amazing! 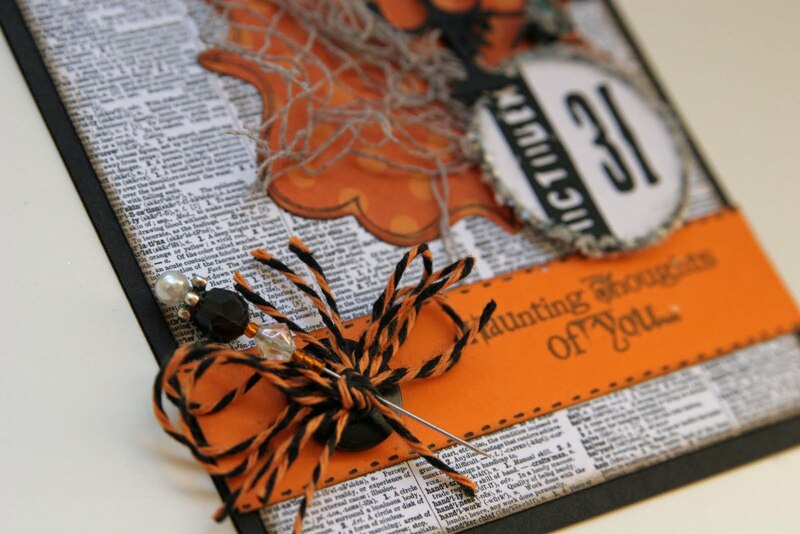 I am in love with this card, the twine and stick pin are a perfect touch! Great card and pin. The spider is a nice touch. wow love this Liz! the papers and twine are perfect! You had me hooked when I saw the newsprint background--so appropriate. Good luck with this Circut Circle entry. I love all the details and the colors--I love everything!! I just love your card today!!! Thanks so much for sharing!!! Love the background text paper. Another excellent DT entry- love the spider web. Ohhh! Love how the twine looks almost spider-like on your awesome card!!! And the stick pin is a fab finishing touch! this is such a COOL card! love the twine and the layers of detail! 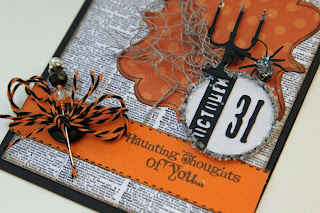 Thids is a great card ( I am partial to Fall colors) I love the background paper as well. Beautiful card. Loooove the papers. And the twine is yummy! Wow I love your card!! Love the Grown up Halloween card. Great job.! I love, love, love this card! Good luck with the Cricut Circle Challenge! You did a great job on this card. What a wonderful way to showcase this set. I can't wait until Friday. Wow Liz, love all the elements to this card! Fabulous details:) Love it! Spooktacular card :) Absolutely love it! Oh Liz, This is fabulous! That Candelabra is fantastic! All the extra's are just awesome! Wicked card & very cool too! Thanks for sharing. Wow so pretty and so much detail! I love this card! I love your spiderweb made with the netting!!!!!!! This is gorgeous in a Halloween kind of way! love all the textures...have to have that die!! This is such a spooktacular card! LOL! Great job! Love this card and all the details on it. Love your card. The pitchfork is Awesome. Ooh spooky, lovely card. Great papers and colours and the sentiment is perfect. L-O-V-E it!!! I like the bkground paper you used Awesome card!! So chic! I love your paper selection and as always the pin! Have an incredible day, TFS. Good luck on the Cricut Circle Challenge. It's beautiful!! Thanks for answering my questions about the layout from Day 1!!! I LOVE this card...thanks for the wonderful inspiration! Oh, this is AWESOME Liz, just way too cool!!! Awesome card! Love that netting you used for the spider web!